For me personally, and countless others, speeding up the process safely is a good reason. 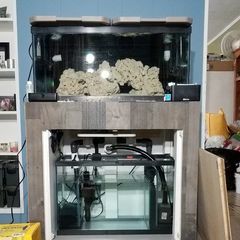 How do you cycle your tanks? First, if you or any of the countless others are an expert, please do as you want.....you might have no need for advice from a public forum in that case....and it what you do works for you, then I'm happy. Last, you and countless others may have missed at least some of the point of our "nothing good happens fast..." motto then. Build the bio-load slowly, by only the smallest reasonable amount with each livestock addition. That's the same advice given to anyone cycling with live rock, though. I only see ammonia dosing/ammonia challenges and bacterial supplements recommended when starting with dry rock, and while the bacterial supplements aren't strictly necessary, I don't know anyone who wants to wait months for the buildup of biofilter on dry rock. I don't consider using live rock rubble or bacterial supplements to seed dry rock to be rushing. I see it as a way to ensure the cycle takes place in a timely manner and a way to add a little biological diversity. It certainly doesn't hurt. Exactly, the actual cycling process depends on what you start from. I think the bottom line is you do need to feed the bacteria something. But there's a big difference between cycling a tank with uncured live rock, cured live rock, or dry rock. With dry rock you have to put something in the tank because there's not much, if any, organic material to decompose and kick start the cycle. The other common use for ammonia is not to feed the cycle, but just to artificially add a little bit of ammonia so you can verify it's cleaned out 24 hours later. Thanks Everyone for the great feedback. Just tested again tonight and I think I'm very close. Last night dosed 2ppm ammonia and now it's 0 on the red sea kit. But I have .2 nitrites and >50 nitrates. I guess one more round of dosing to make sure the nitrites get down to 0? Also, does the level of nitrates matter? Yep, you just need to wait until you get zero nitrites. 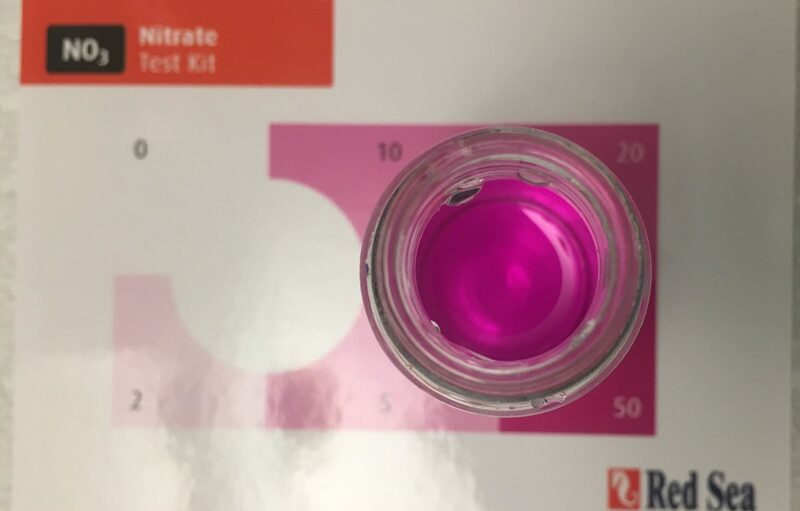 It's unusual, but I've known of at least two or three people that have had it take a couple weeks for nitrites to go to zero after ammonia goes to zero. There's no apparent reason for it, but also no need to worry. Once that happens, you start doing water changes to bring nitrates back down. I know this is reaching a little, but I'd even consider dry rock to be a form of rushing it. If everyone was willing to save up for their equipment, rock and livestock vs buying right now, price almost drops out of the equation. If everyone then had the money for live rock and the rest of what they needed for the tank (from saving up for it) would anyone turn around and buy dead rock instead? Nobody wants to wait for anything, patience is the most endangered natural resource....when folks don't wait for things to happen in their time, that's what it means to rush things. BTW, starting a dead rock tank isn't unlike starting a tank with an undergravel filter with a bag of gravel on top. My formula works well in that situation too. You may have to go even a bit slower in stocking, but that's not a real problem. The hitch is that you don't end up with a tank of live rock for at least a couple years, and effecting that transformation is something you have to figure out how to do correctly. Getting a "bargain" up front by purchasing "dead rock" only to be left with something of comparatively limited function (more like an undergravel filter) sort of seems like a false economy. SO MUCH has to be done to enliven dead rock, and will it ever be as good as the real thing? The best you can say going into it is "maybe". As long as, everything has a sustainable food source the cycle is complete. I went slow and kept a journal of parameters. I think it's a slow progression of additions(and subtractions) designed on the tanks needs...forever, not just during cycling. That's an excellent way to put it. Keeping a tank diary or log is highly underrated too.....I kept one for years when I started and found it to be very valuable...especially the log of test results. I had the money to buy live rock but chose to go with dry rock instead to avoid introducing anything unwanted into my tank and because I truly enjoy starting from scratch so things can be done the way I want them to be without any unknowns. However, I also knew when getting into the hobby that I was going to have to be patient and fortunately, I am decent at self-control. I still feel like I rushed some things, (my stand, my plumbing, my first few equipment purchases) but the one thing I don't feel I am rushing is my cycle. Adding Nitrifying bacteria and Ammonia to start the cycling process inside a tank with no other source of pre-existing life just seems like the most logical way to go about it. 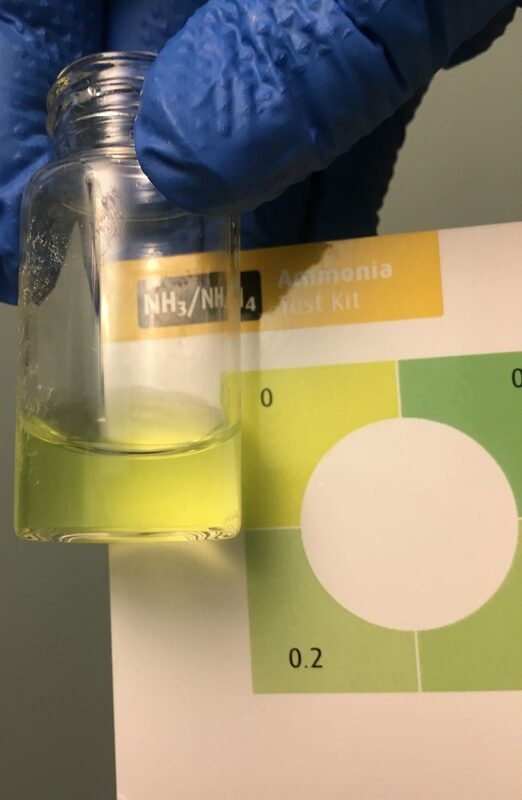 You need bacteria to process Ammonia into Nitrate but if there is no Ammonia, what's going to feed the bacteria and promote growth and how are you going to know if the cycle if complete when there was never any Ammonia to test? I'm still new so believe me, I dont have the best grasp on anything in the hobby. For all I know I did everything completely wrong. This is just my thoughts and personal opinion on the matter and why I chose dry rock over live rock. The hobby existed for decades before live rock was "discovered". Some tanks from then were still running into the 1990's. Because of that we have lots of historical perspective on dry rock vs live rock....but the folks with that experience aren't the ones selling the products. In fact, before the "discovery" that live rock could/should be used for every tank -- back when bleaching your rock once a week was a thing because of how bad it would get -- live rock WAS still mentioned in books occasionally. In one book from the 1950's I have that mentions live rock, it's almost considered magical in it's effect when it was placed into an unstable tank that was mysteriously having no luck keeping fish alive and turned it around to a healthy tank. So using dry rock was completely normal for a LONG time. Then live rock was "discovered". In spite of all the history of using dead rock, live rock was SO GOOD EVEN IN SPITE OF HITCHHIKERS that 99.99% of whole hobby switched over to it. Seems to me that history is just about lost and we're heading back to some version of the 1990's....or 1950's. If you see what @paul b does to enliven his tank (google it or check out his book), that's what I'd suggest for you or anyone starting with dry rock. Unfortunately, not many of us have those kinds of resources available. That lack is why most of us are best-served by live rock. Folks with experience will tell you not to worry about hitchhikers....they're not insurmountable when they happen, and they don't happen all the time so that you really need to pre-worry. It's not like you can avoid pests in the tank just by using dead rock anyway....at best you're exchanging one uncertainty for another, at the expense of short and medium term tank stability....perhaps long term stability as well if you can'y successfully "raise your rock" to live rock status, an even bigger uncertainty. Post-cycle, early in a tank's history, dead rock is about like any other inert bio-media and has only a minimal effect on stabilizing the tank.....not much more than a nitrogen cycle happening. That's not too different than how it was in the 1950's. Thanks @teenyreef. Just to be clear - are you saying I should dose again until BOTH ammonia and nitrites are at 0 a day later? 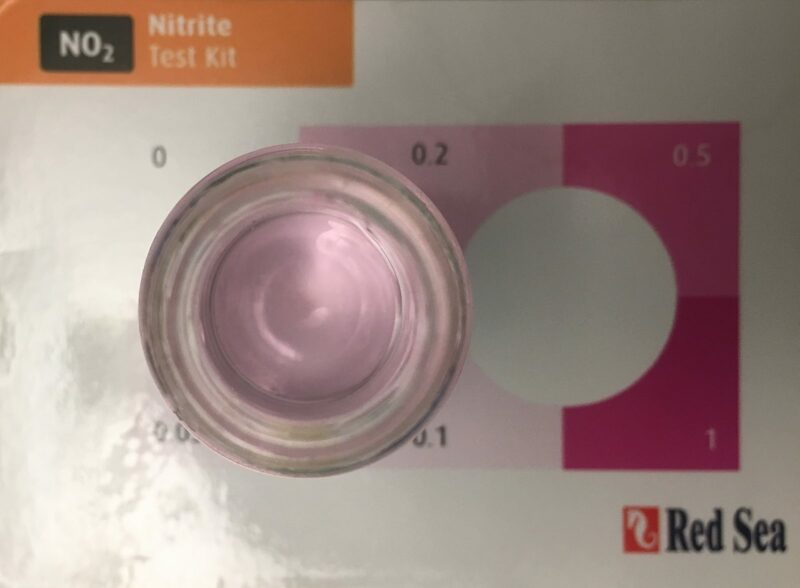 Or, now that I can clear 2ppm ammonia in a day, I should just wait for Nitrites to go to 0 without doing anything further? Then I can add fish. Also, anyone know what this brown crap on my rocks and in my sand are and what I should do about it? Either way will work. The true test of success is when both are zero 24 hours after adding ammonia. The brown stuff looks like diatoms, which are a normal stage at this point. They usually go away after a couple weeks although they lasted about six months in my 40g. You're going about this completely right. You're doing your own research, asking questions, getting multiple points of view, and then making the decision based on what fits your personal preferences. Have you started a build thread? As some of the other posters have noted, keeping a journal, preferably with pictures, is invaluable. And it helps people better understand your specific tank and personal goals when answering questions. I agree. Diatoms are "powdery" if you go and try to touch or move them if you want a test.....other brown algae would have a different consistency. I picked dry rock partly for budget reasons and partly in an effort to achieve a specific aesthetic with my aquascape. I think scape considerations are one of the biggest reasons folks choose to go to dry rock over live. Saying it takes a couple of years for it to become live rock isn't really correct as technically speaking it's "live" as soon as bacteria have colonized on it. It just doesn't have the biological diversity of live rock from the ocean. And for people starting a large tank, getting live rock versus dry rock (or a combo) can mean the difference of thousands of dollars. Trends in most hobbies are cyclical. Right now dry rock is an in-vogue option (although I remember it being discussed when I was new, including how to make your own rock). In a few years, maybe it will be out of style again. Locally, all that's available is dry rock gone wet or that "Real Reef" type rock that's been infused with bacteria. The shop I once got nice Florida rock from closed a few years ago. I would agree that it probably takes longer for a dry rock tank to stabilize and mature. Based on my own experience, I probably won't do a dry rock tank again, plus there's just something about all the hitchhikers you can get with live rock that I really love (except for getting rid of the ones I don't want lol). I haven't found it to prevent pests really as I've still had cyano, hair algae, dinos, and bubble algae and I suspect I haven't enough biological diversity to really help the tank fight these pests off. Past tanks with live rock still had hair algae and bubble algae (though it seemed easier to control) and I never encountered cyano or dinos back then so take that for what you will. I've seen Paul B's tank and am always so impressed that he's kept the tank running for 40 years. Our own @Subsea has a tank that's 25 years old and I'm sure has seen trends come and go in the hobby. The beauty of this hobby is, like someone else said, that there's not really right or wrong ways to do most things in the hobby. Just different. Saying it takes a couple of years for it to become live rock isn't really correct as technically speaking it's "live" as soon as bacteria have colonized on it. It just doesn't have the biological diversity of live rock from the ocean. The authentic definition of "live" in this context that has seen pretty consistent usage over time (decades) really is the one that refers to the increased level of bio-diversity that you mentioned.....bacteria is really a tiny part of equation. I pointed out that anemone rocks and live gorgonians seemed to purify water that was normally toxic to fish. They seem to give "life" to an aquarium that had been plagued with failures. I have seen this happen many times and nearly always with complete success. Now this was not a question of bacteria, or the lack of it, in the aquarium, for the aquarium was loaded with bacteria, but yet would somehow be toxic to marine life. Something was missing! But by adding live rocks and gorgonians, the aquarium would flourish and support a fantastic wealth of both fish and invertebrates. An essential substance would somehow be added. The ocean is a very complex medium. It contains all of the known elements and much more. It is a sea of "life" and a little of this "life" must become established in your aquarium before it will function properly. The problem is less complex with fresh sea water, but with artificial, it soon becomes apparent that there is more to keeping a saltwater aquarium than inoculating the tank and checking the nitrates. 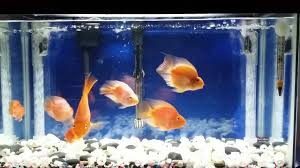 If you have added enough water from a healthy aquarium, or fresh sea water, to your artificial ocean, and have enough of the essential unknown substance, your tank will flourish. If not, it will be a failure until such time that the life-sustaining material has become established in the aquarium. The vital substance, perhaps an antibody, appears to protect the fish from bacteria and without it, the fish quickly succumb to disease. from Salt Water Aquarium Magazine, vol 1, no 3, as reprinted in the book "The Salt Water Aquarium In The Home", 4th Edition, by Straughan. this is a great thread! learned a lot! so basically add bacteria and ammonia on the first day. do regular tests to see how long the bacteria processes the ammonia and nitrites. dose ammonia when necessary to see if the bacteria can process it in 24 hrs. if it can, cycle is done! one can choose a traditional process or one can choose a modern approach. to me it doesn't seem like rushing. I see it as a more efficient way of cycling. better for newbies i think. with permission to the OP i'd like to ask a question. I have drop ATS from santa monica. when do i add this to my system? right after cycle ends or after a few weeks when i have fish in the tank? It's comparing apples and oranges, though. It doesn't really work to argue that gravel isn't called "live gravel" because while gravel does provide surface area for beneficial bacteria, the bulk of freshwater biological filtration is located in the filter, with a bio wheel or a sponge and ceramic media, or something along those lines. Sure, we don't call the sponges "live sponges," but I've always heard the term "live rock" referring to the rock that provides surface area for bacteria to grow in a saltwater tank, whether it's straight from the ocean or not. I know that methods have evolved over the years, but these days it's a pretty safe bet that using dry rock isn't going to result in a tank that's toxic to marine life. Whether dry rock is inferior to live rock is, I think, a matter of opinion and will vary based on your goals and values. Dr Tim's has a downloadable "Fish-Less Cycling Guide" that gives you day by day instructions on when to dose Ammonia, what to test, etc. I followed this guide exactly and it was just about spot on but I added Dr Tim's One and Only on Day 1 and had no results by day 7 or 8 when I should've been adding 3rd dose of Ammonia-chloride. I then added a bottle of Bio-Spira, enough for 30gals but my tank volume is 60g, and waited until Ammonia hit 0. Then I dosed again, waited for 0, and dosed a third time. This all matched up with the guide and by the 3rd dose Ammonia was at 0 within 24 hours. I am going to do a forth 2ppm dose of Ammonia-chloride just to be safe but waiting for my nitrates to come down below 1ppm. I'm pretty sure you wait in between dosing so you can monitor it closely and accurately. Also, I feel like maybe the Ammonia-Chloride lowers the PH and that's why you have to monitor it to make sure it stays above 8. I could be wrong but just a thought. I believe there are many ways to do things in the hobby and multiple methods that lead to success. If the end results are the same though, does it really even matter? No matter which way you choose to go there will be pros & cons. And isnt "live rock" just "dry rock" that has been in saltwater for a period of time and has built up different types of bacteria? So wouldn't ALL "dry rock" eventually be "live rock" as long as it's in saltwater that mimics the ocean; ie our aquariums? There is liverock straight from the ocean which there is a difference to dry rock that becomes live. It's getting harder to find in some places because of laws on collection of liverock. Eventually dry rock does become liverock but the diversity of life isn't quite the same and takes a much longer time to develope. So what's the difference? What's in the ocean that's not in our aquariums that makes ocean live rock different or "better" than live rock from an aquarium? I've done a lot of research for the past few months while trying to get my tank started but I dont remember seeing or hearing this. It's crazy how depending on where you get information, you may only be getting half the information. It doesn't really work to argue that gravel isn't called "live gravel" because while gravel does provide surface area for beneficial bacteria, the bulk of freshwater biological filtration is located in the filter, with a bio wheel or a sponge and ceramic media, or something along those lines. but I've always heard the term "live rock" referring to the rock that provides surface area for bacteria to grow in a saltwater tank, whether it's straight from the ocean or not. Live rock is rock from the ocean that has been introduced into a saltwater aquarium. 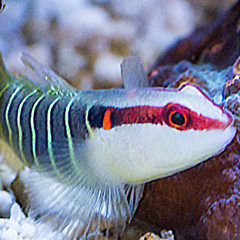 Along with live sand, it confers to the closed marine system multiple benefits desired by the saltwater aquarium hobbyist. The name sometimes leads to misunderstandings, as the "live rock" itself is not actually alive, but rather is simply made from the aragonite skeletons of long dead corals, or other calcareous organisms, which in the ocean form the majority of coral reefs. When taken from the ocean it is usually encrusted with coralline algae and inhabited by a multitude of marine organisms. The many forms of micro and macroscopic marine life that live on and inside of the rock, which acts as an ideal habitat, give it the name "live rock". I know that methods have evolved over the years, but these days it's a pretty safe bet that using dry rock isn't going to result in a tank that's toxic to marine life. To be honest, I’ve stopped reading your posts thoroughly and skim through them. Mostly because you come across a bit aloof. Now, I do that often too, but I do try and only speak up when I’m at least half certain I’m not far off the mark. Your delivery though, is that of a father telling his son why he’ll never be as good as he was at anything, and frankly it’s a bit annoying. I’m glad you’re so certain of your opinions, and that you’re trying to help people, but quit sounding so closed-minded. Its virtually impossible to get what is in the ocean(there are millions of organisms, micro organisms, micro fauna etc) in a tank without introducing it from the ocean. 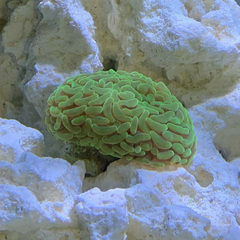 Just like coralline algae, much life must be added to have it in the tank. There is a significant difference in what comes from the ocean to what's in our tanks. My tank that was started with dry rock is different than my tank with fiji liverock. Both tanks started 3 months apart. Completely different experiences and even life within the tank. To be honest, I’ve stopped reading your posts thoroughly and skim through them. Proof you can't beat marketing. The new BRS/WWC method has arguably the most current and relevant talk about “cycling” our tanks. It’s worth the 6+ hours to watch all of the new series they have been doing, but especially the bits on Bio-Filter and Cycling.